Ventifacts are rocks abraded by windblown particles, generally or exclusively sand (Laity and Bridges, 2009). On Earth, they are found mostly in arid regions with little vegetation, a fairly abundant supply of sand (or an ancient supply for relict ventifacts), and winds capable of exceeding the threshold speed necessary for sand movement. Their form depends on original rock texture, shape, and composition, with common forms including facets sloping into the wind and wind-aligned elongated pits, flutes, and grooves. The direction of facet dip slopes and the long axes of textures serve as proxies for the predominant highest speed winds that carried the sand and thereby serve as paleowind indicators. It is common for ventifact textures to result from mineralogical or petrological hardness variations in the rock or from primary textures such as vesicles. Image 1:a) Elongated pits and flutes in limestone/marble within the Little Cowhole Mountains, Mojave Desert, CA. b) Pits, some maybe primary vesicles, and flutes in basalt from the Cady Mountains, Mojave Desert, c) Flutes in Diorite from hills east of Silver Lake, Mojave Desert. As an example for Earth, we focus on three rock types that this author has studied in the Mojave Desert: Limestone, basalt, and diorite (Image 1). The linear fabric of marble, from the Little Cowhole Mountains, precludes the formation of abrasion pits. 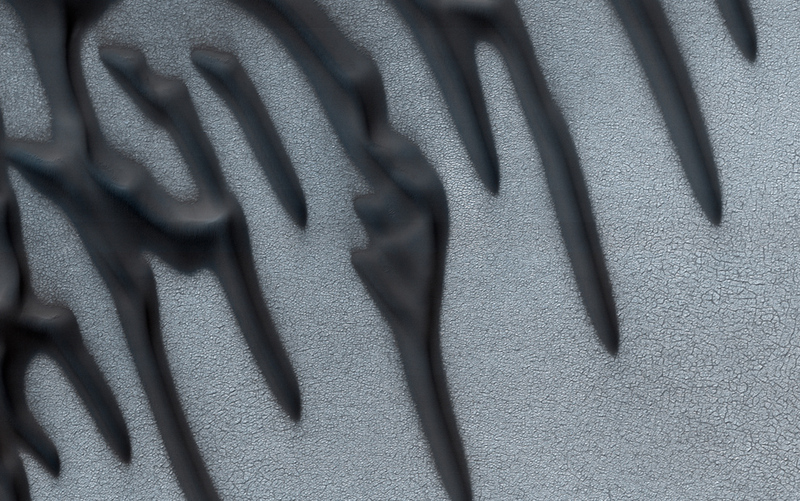 Abraded limestone textures therefore represent an endmember case in which hardness heterogeneities are distributed linearly, as opposed to point-to-point. The Cady Mountain basalts contain vesicles, identified as such because faces shielded from the wind contain pits. It seems that the vesicles serve as nucleation sites for abrasion and develop into flutes over time. These rocks are aphanitic and do not have hardness variations at a scale larger than an impacting sand grain (> 100 µm). The diorites at Silver Lake are another class. These rocks lack vesicles, but at the millimeter scale exhibit a pit- and mound-like texture that is probably due to differential mechanical weathering of the minerals. These may then develop into flutes. There are therefore 3 end member cases in which pitting may or may not play a role in rock abrasion: 1) Rocks with linear (not point-to-point) hardness variations and no primary pitted texture (Cowhole limestone), 2) Rocks with no hardness variations but primary textural heterogeneity in the form of vesicles (Cady basalt), 3) Rocks with point-to-point hardness variations and no primary pitted texture (Silver Lake diorite). Image 2: Definitive ventifacts on Earth and Mars. Top: View of fluted Mazatzal rock at the Spirit site (Pancam composite color). Blue box at left is the outline of the close-up at right, where grayish dust-free areas, uncovered by the rock abrasion tool and brush, are visible. Bottom: Terrestrial analog. A basalt at Rasor Road, Mojave Desert, Earth. 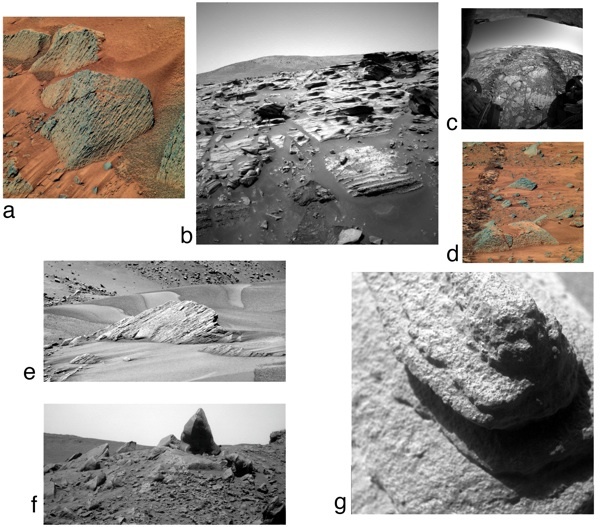 Many rocks observed by the Viking and Pathfinder landers and MER rovers exhibit characteristics of ventifacts with various textures and facets. 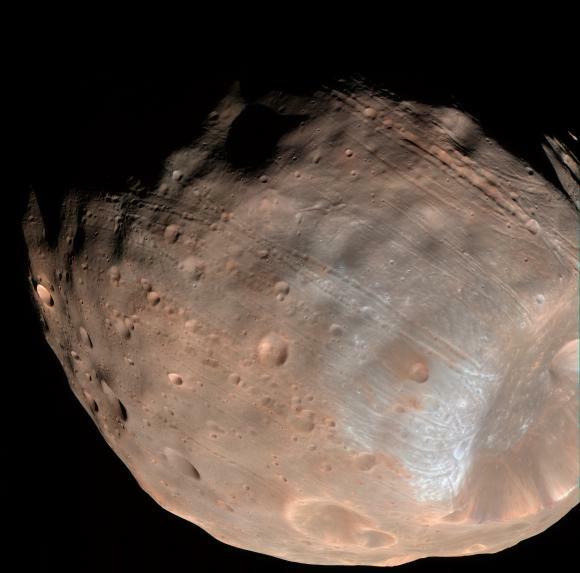 The finding of these rocks is not surprising given that the kinetic energies of saltating particles is predicted to be comparable or higher on Mars than on Earth [Bridges et al., 2005]. 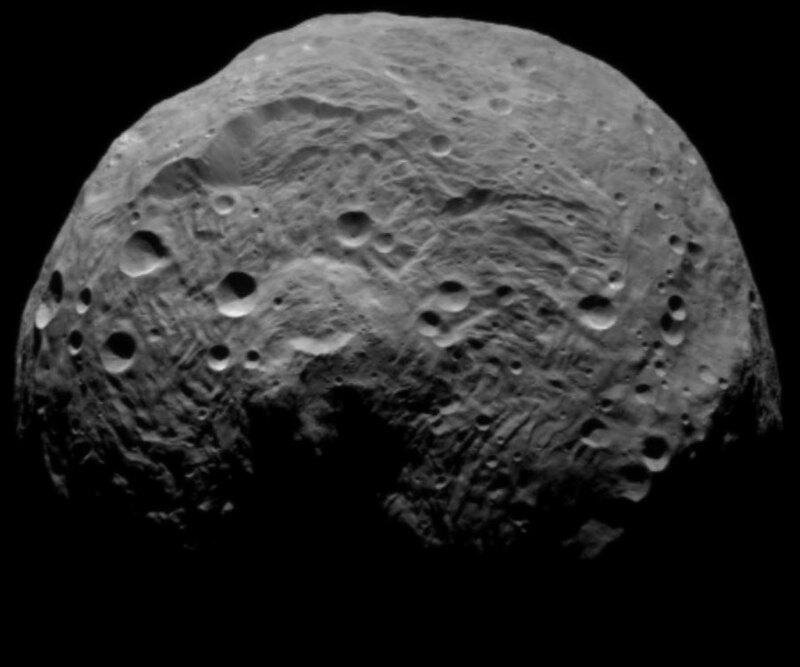 For example, rocks on the Gusev plains at MER Spirit site exhibit large scalloped or fluted upper edges and pits that are almost certainly abrasion features (Image 2). Compelling small flutes and grooves are seen on many other rocks (Image 3). Some of the best examples at the Spirit site are on and near the summit of the Columbia Hills [Thomson et al., 2008] (Image 4a, b, d-g) where topographic funneling and acceleration of wind flow has resulted in effective sand abrasion. 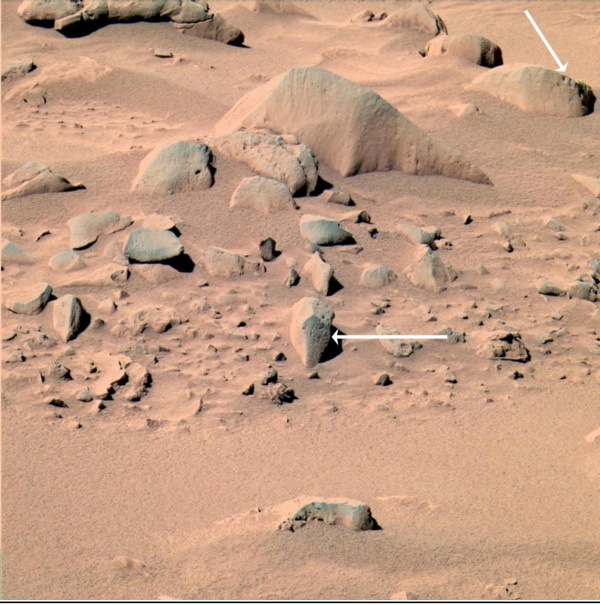 At the Opportunity landing site, hard hematite concretions (“blueberries”) are more resistant to abrasion than the sulfate-rich rock matrix, thereby projecting into the windward direction [Sullivan et al., 2005] (Image 4c). In addition to serving as records of the efficacy of abrasion, the wind directions derived from ventifacts on Mars have served as vanes for current and past local winds [Bridges et al., 1999; Sullivan et al., 2005; Greeley et al., 2008; Thomson et al., 2008]. Image 3: Probable ventifacts on the Gusev Plains of Mars. Color composite view of rock field at the Spirit site, Sol 97 (Pancam composite color). Arrows point to rocks that have nearly definitive aeolian flutes on their upper and top edges. Other rocks in the scene may also have abrasion features, but more detailed analysis is needed for thorough identification. Image 4: Ventifacts and abrasion textures on Mars: (a) Fluted rocks at the Spirit site (Pancam composite color, Sol 584). (b) Bedded rocks that have preferentially abraded along weak layers, Columbia Hills, Spirit site (Pancam, Sol 754). (c) “Tails” in the lee of resistant nodules within sulfate-rich soft rock at the Opportunity site (Hazcam, Sol 142). (d) Faceted and fluted rocks at the Spirit site (Pancam, Sol 585). (e) Faceted rocks near bedforms at the Spirit site (Pancam, Sol 620). (f) Faceted rocks at summit in Columbia Hills, Spirit site (Pancam, Sol 1344). g) Microscopic image of rock texture in vicinity of Image 1b (image width is 3 cm, Sol 753). Laity, J.E. (1987), Topographic effects on ventifact development, Mojave Desert, California, Physical Geography 8, 113-132. Laity, J.E. (1992), Ventifact evidence for Holocene wind patterns in the east-central Mojave Desert. Zeitschrist fur Geomorphologie, Supplement Band 84, 1-16. Laity, J.E. (1994), Landforms of aeolian erosion. In: Abrahams, A.D., Parsons, A.J. (Eds. 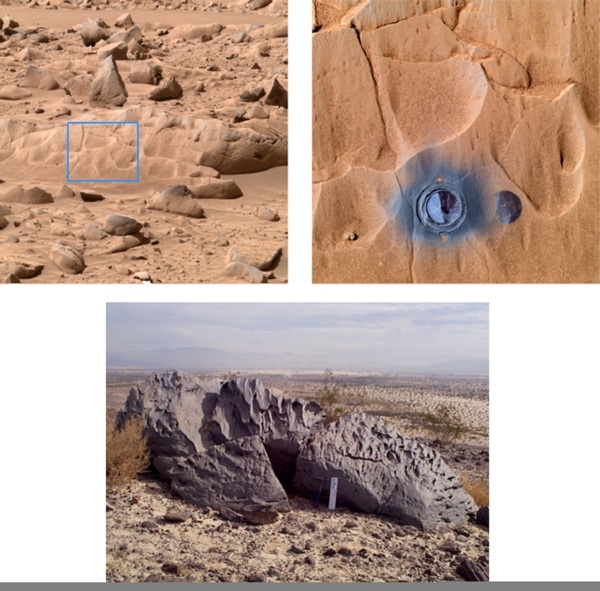 ), Geomorphology of Desert Environments, Chapman & Hall, London, pp. 506-535. Laity, J.E. (1995), Wind abrasion and ventifact formation in California. In: Tchakerian, V.P. (Ed. ), Desert Aeolian Processes. Chapman & Hall, London, pp. 295-321.